Serene Setting in Excellent Location! Your Home in The Gorge set on 1.84 Acres! 3 Bedrooms - 2 1/2 Baths. Many Upgrades! 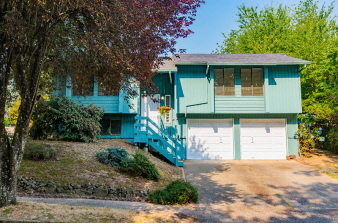 Corner lot in wonderful Tualatin neighborhood on quiet street. Features 3 bedrooms on main level. Master with bath. Living room with wood burning fireplace. Kitchen with granite counters. Dining room with sliders to back deck. 4th bedroom potential in lower level bonus room. Generous sized, private backyard, full fenced, fruit trees. Newer roof and carpets. Minutes from shopping and public transportation. Add your personal touch! Interior Features Newer carpet; fireplace; lower level with bathroom. Additional Features and Amenities Great Tualatin neighborhood!